I was there for this fantastic pic n mix seed potato shop from Pennard Plants. These seed people really know their stuff. Oh the joy of having a nerdy conversation with another veggie fan is just so exciting. Take a paper bag and pick your seed potato varieties for just 22p each. This is just so great because elsewhere you have to buy a huge sack full when you just want to try a short row of each. You could buy shallots or onion sets by the cupful. And you could buy Aquadulce broad bean seeds by the scoop full. So what did I go for? Some Ratte salad potatoes, Red Duke of York, and my all time favourite first early new potato Epicure. Beg, steal or borrow and find yourself some Epicure potatoes my friends. I remember growing this variety when I was a small child. The taste is the best you will ever find. Would you like to try to get in the Guinnes Book of Records? If you plant your chilli seeds now you can see if you could grow the longest chilli! The lovely people at Sea Spring Seeds are holding a competition to see who can grow the longest chilli. Apparently there is currently no record, so whoever wins this competition will be holding the new record! You can have a look on the Sea Spring website for how to enter. This sounds like a great thing to do this year! I have bought two varieties of chilli which might do. Joes Long Cayenne Chilli, and a really interesting variety called Spaghetti. 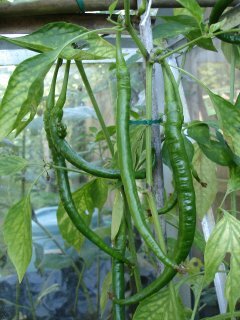 I did grow some Joe's Long chilli back in 2006, the plants were about 4 feet high and the chillis were at least a foot long. They ripen to a glorious red colour. Anyone fancy a go? There was a pile of old wooden fence panels at the end of the garden, so this week I took advantage of the dry weather to have a bonfire. So yesterday on Ash Wednesday I had a lovely pile of wood ash to collect. 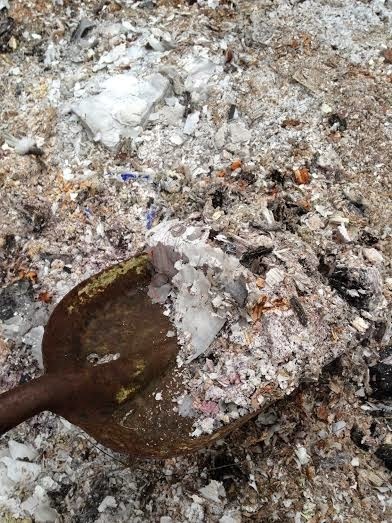 Wood ash is a great source of Potash for the soil. Wood ash is a good tonic for the soil, especially around fruit trees and bushes. So out I went around apple trees, loganberries, gooseberries, blackcurrants and rhubarb. There are signs of the rhubarb crowns breaking the surface of the soil. Yesterday was a bright, sunny day and I managed to get some weeding and digging done out on the allotment. But I was being watched! This fox was laying on the shed roof taking advantage of the warm sunshine. The growing season is just about to start, so I bought a few bags of seed compost to get going with a few early sowings in the heated propagator in the greenhouse. Here we go!